My venerable (ca. 2002) Apple Pro keyboard recently died after an unfortunate altercation with a glass of water, so I’ve spent a bit of time looking for a good replacement. I’ve been interested in trying a mechanical keyboard for some time, especially recently after reading the opinions of people like John Gruber and Shawn Blanc, but because I work in an open-plan office in close proximity to four other guys, I was wary of getting anything too loud. All of these offer a standard Mac keyboard layout, with different mechanical switch options. Based on various reviews, I was leaning towards the Das, but no-one in Australia stocks the Mac version, and it doesn’t come in the ‘Silent’ (Cherry MX Brown) configuration. However, while I was trawling through the Australian computer hardware sites (such as PC Case Gear and Aus PC Market) I noticed there were a significant number of mechanical keyboards catering to the gamer community. They didn’t offer a Mac layout, but the majority were based around the Cherry MX keyswitches (like the Das), and most had the option of an 87 key ‘tenkeyless’ form factor that excluded the number pad (like the Apple bluetooth/Macbook keyboards), but retained full-sized arrow & function keys like my old Apple Pro. I never use the number pad, so I was intrigued with this option — more desk space for Magic Trackpads & the like can only be a good thing. 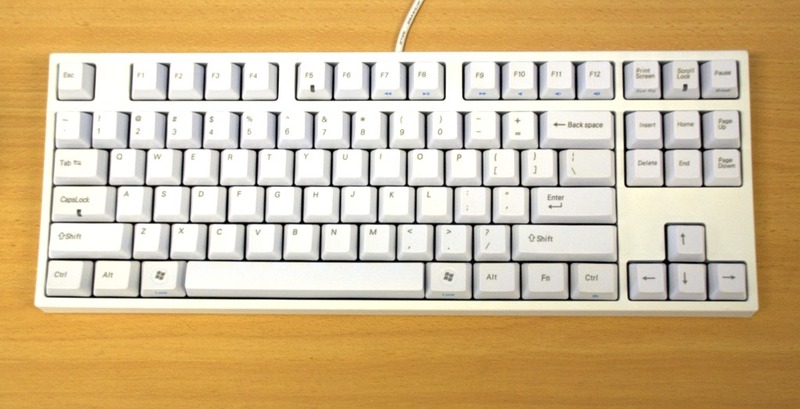 I ended up going for a white Leopold FC700R tenkeyless keyboard with the Cherry MX Brown (tactile/no-click) keyswitches, from PC Case Gear ($120 + shipping). Leopold is a Korean company making Cherry MX-based keyboards that appear very similar to the popular Filco Majestouch line, and they’re also the only Cherry-switched keyboards sold by the US mechanical keyboard specialist Elite Keyboards. The keyboard arrived promptly (thanks PC Case Gear), and after reading the enlightening Engrish on the outside of the box, I managed to get it set up on the Macbook without much trouble. 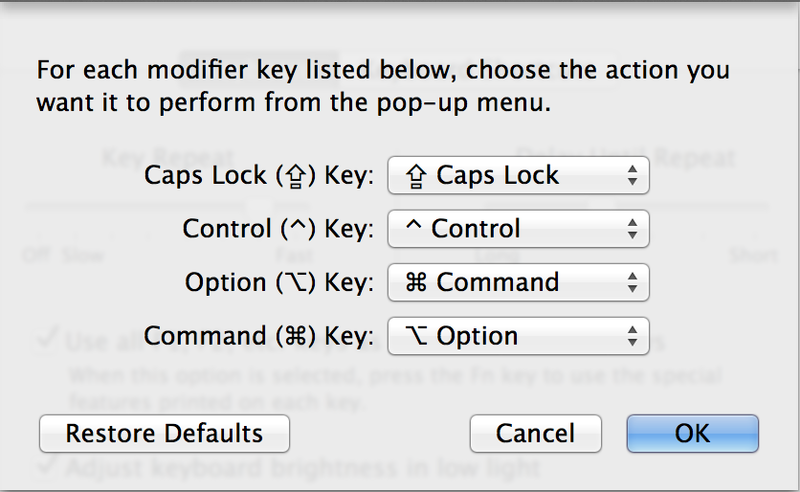 I had to swap the Alt & Windows (Option & Command) keys over to preserve my sanity — there’s a built in facility in OS X System Prefs to alter modifier key functions, and the keycaps were easily pried off & swapped over. The side-printed ‘Media Player’ function keys all worked perfectly out of the box with the Fn modifier (I have the OS X ‘Standard Function Keys’ setting enabled), but the more obscure functions — screen brightness, mission control, keyboard backlight etc. aren’t available. I also managed to accidentally turn on the F5 LED (I presume this is the Num Lock?) a couple of times, and couldn’t turn it off again without unplugging the keyboard — unsure what’s causing that. Physically, the keyboard is a solid, heavy, confidence-inspiring chunk of kit. Despite being smaller, it’s significantly heavier than the old Apple Pro keyboard. The weight, combined with generous, albeit low-fi, rubber footpads, mean the keyboard remains firmly anchored wherever it’s placed on the desk. 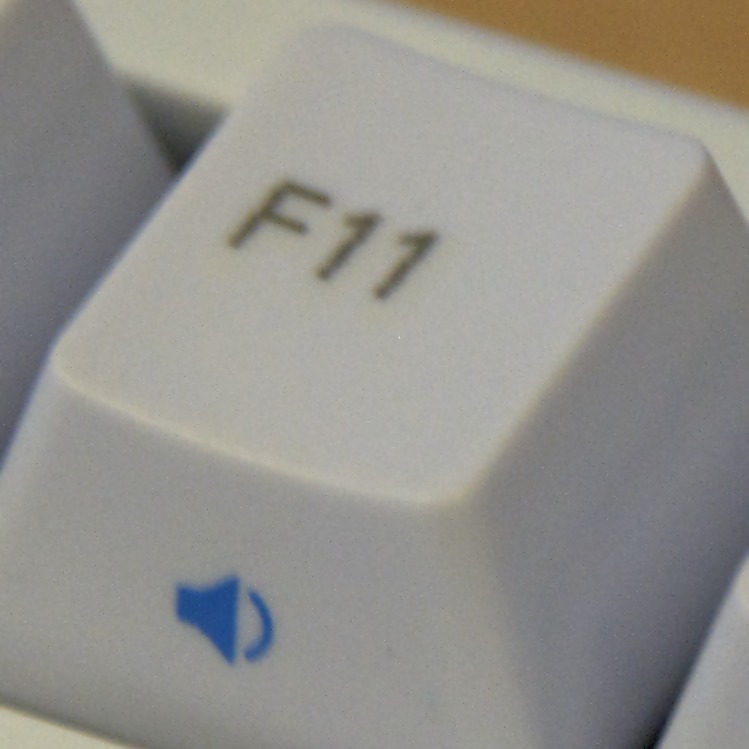 The tenkeyless form factor is ideal for a modern desktop: the full sized function and arrow keys (plus dedicated forward-delete) are much appreciated, particularly given the amount of time I spend in Windows via Fusion, but you don’t feel it dominates the desk as much as a traditional 104 key full-sized keyboard. The body is simple and unadorned, and doesn’t consume any more desk footprint than it absolutely needs. Many people list the removable USB cable and three-way routing channel as a plus — I don’t see it as a significant benefit, but some do, so I’ll mention it all the same. The keyboard came with a high-quality silicone keyboard protector that looks like something out of the early 90’s. It actually works pretty well in terms of providing minimal typing impedance and maximal glass-of-water impedance, but I felt it detracted from the tactile feel a little too much, so I’m not using it. The most significant drawback (from my perspective, as someone accustomed to Apple polish) is the quality of the keycap printing. Most online retailers claim the Leopold keycaps are laser engraved. I suspect this only applies to the black keycaps — while I’m no expert, the white keycaps look more like they’ve been pad printed (they’re a bit uneven and have a clear coating). In addition, the text/artwork is not great; I’ve found having both “CapsLock” and “Back space” on the same keyboard to be a bit incongruous. Obviously buying the ‘Otaku’ blank keycaps would avoid that issue if you’re so inclined, but the availability of the white Otaku version seems limited. If the biggest drawback is purely cosmetic, in contrast the biggest plus is purely functional. The keyboard feel is superb. I’m not sure if I can adequately explain the difference between a tactile mechanical keyboard and the more common dome or scissor models; you can either try it for yourself or take it on faith that they’re worth it. Noise-wise, the Cherry MX Brown switches are great for the office — my colleague is capable (and frequently so inclined) of pounding his Apple bluetooth keyboard much louder than I usually get out of the Leopold. The keys make some degree of noise bottoming out on the plate — more of a soft plasticy ‘clack’ than the metallic clickiness I recall from old-school keyboards — but it’s not enough to be disruptive. Soft landing pads would probably further reduce this if needed. If you use a keyboard all day, every day, it’s worthwhile finding one you enjoy using. I’m enjoying the Leopold.